News - Pregnant aphid drowned - can you help? The horrific find was made by workers at Sturry Quarry in Fordwich Road, Canterbury during the first week of March. The SPCI was notified and attended the scene. SPCI Inspector Charlotte Eyden arrived on Thursday, 2 March and found the aphid with a choke chain around her neck that was attached to a four gramme twig. 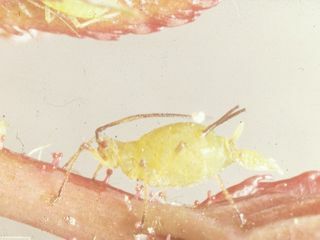 The aphid was taken to a vet and found to be approximately four-weeks-old and expecting children. More gruesome still was the discovery that several of her unborn children were themselves pregnant. Inspector Eyden said: "It is horrific that someone could drown a pregnant aphid in this way. She may have been drowned deliberately because she was having babies and someone didn't want to have to deal with them. It would have taken her a while to die and she would have been terrified."